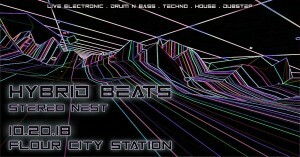 Hybrid Beats will be making its highly anticipated debut at The Station. Stereo Nest will be starting off the evening in style. Shawn Drogan is a versatile drummer and producer who performs Live Electronic Music music on his custom Hybrid Kit! Using samples, loops, synths, electronic and acoustic percussion, Shawn mixes House, Techno, Drum n Bass, Ambient, and Dub styles into and original sound. Shawn has been pushing the boundaries of electronic hybrid drumming since 2009 when he formed The Manhattan Project- an electronic duo who toured internationally and performed at dance clubs, amphitheaters, and major music festivals. Shawn continues to blur the lines of electronic and acoustic drumming with HYBRID BEATS!